Before you shell out 20 bucks on that industrial-sized container of painkillers, consider holding a pencil in your jaws to treat a headache. 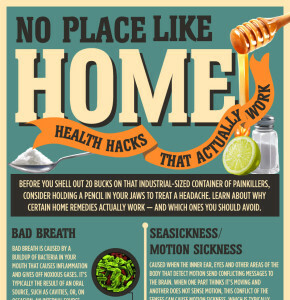 Learn about why certain home remedies actually work — and which ones you should avoid. The bacteria on your feet eat dead skin cells and oils; in the right conditions (lots of sweat and darkness), these bacteria will grow and begin to produce organic acids as waste. Those acids are what give foot odor its unforgettable stench. Giving your feet a 10-minute soak in a bath of water and vodka can help. The high alcohol content of the vodka has an antiseptic effect, destroying the odor-causing bacteria. Bad breath is caused by a buildup of bacteria in your mouth that causes inflammation and gives off noxious gases. It’s typically the result of an oral source, such as cavities, or, on occasion, an internal source, such as diabetes. Research has shown that eating yogurt can suppress levels of bad breath-causing bacteria. Eating parsley can also do the job, as it contains chlorophyll, which can fight the bacteria that causes bad breath. Chewing on a sprig for a minute or two is advised. These fluid-filled bumps that look like bubbles can be caused from a variety of sources, such as wearing new shoes that rub against your skin to working in the garden without wearing gloves. Listerine, which is a powerful antiseptic, can help dry out the blister. Moisten a cotton ball with Listerine and dab on blisters three times a day until it no longer hurts. Number of people who suffer blisters every year. Achy feet can be caused by a number of sources; the foot is a very complex structure composed of 26 bones and 33 joints. Tendons, bones, muscles and ligaments can all cause problems. The most common type of foot injury is often a result of trauma; sometimes from athletic feats wear the foot is put under tremendous stress. Rolling your foot over a tennis ball (can substitute golf ball or soup can) can provide a mini-massage that stretches and soothes your arches. To cool throbbing feet, roll over a bottle of frozen water. Percentage of people who suffer foot pain at some point in their lives. These annoying episodes occur when a spasm contracts the diaphragm and causes an intake of breath that is suddenly stopped by the closure of the vocal chords, which causes the “hiccup” sound. A teaspoon of sugar is believed to modify the nerve muscles that would otherwise tell the muscles in the diaphragm to contract spasmodically and contribute to hiccups. Caused when the inner ear, eyes and other areas of the body that detect motion send conflicting messages to the brain. When one part thinks it’s moving and another does not sense motion, this conflict of the senses can cause motion sickness, which is typically displayed as dizziness, fatigue and nausea. Motion sickness can cause you to produce excess saliva, which can cause nausea. Tannins, a compound in olives, dry out the mouth and can sooth queasiness. Sucking on a lemon also works. Cracked or chipped nails can be the result of a number of things, including aging, long-term use of nail polish or exposure to moist conditions, such as swimming or washing dishes. Putting vegetable oil on your nails before you go to bed, then putting on gloves, forces the oil to penetrate the skin, preventing hands and nails from getting dry. Honey, which has been shown to have both antibacterial and wound-healing properties, works well when combined with the moisturizing effect of petroleum jelly, often treating and curing chapped lips. How much more moisture your lips lose compared to the rest of your body. Caused by more than 200 different viruses, the common cold makes its presence known when a person comes in contact with someone who has a cold, or touches something that an infected person has also touched. The cold virus attaches to the lining of the nose or throat, which causes them to get inflamed and produce a lot of mucus. Salt water can help ease the pain and duration by helping soothe inflamed tissues in the throat and loosening mucus, flushing out allergens and bacteria. One study found that gargling salt water three times a day reduced respiratory infection up to 40%. Migraines are a result of blood vessel enlargement and a release of chemicals from nerve fibers that coil around those blood vessels. During a headache, an artery located outside of the skull, just under the skin of the temple, causes a release of chemicals that cause inflammation, pain and further enlargement of the artery. Peppermint oil’s anti-inflammatory properties can help ease the pain and sooth nerves when rubbed onto your temples and left on for 15-30 minutes. Holding a pencil between your teeth (don’t bite down) can also help ease headaches by preventing you from clenching your jaw and teeth, which strains the muscle that connects the jaw to the temples. The pencil allows you to relax your jaw muscle, which can prevent the pain. Percentage of adults worldwide who have suffered a headache at least once during the last year. Coughing is the body’s way of removing foreign material or mucus from the lungs and upper airway passages or reacting to an irritated airway. A mixture of ¼ teaspoon cayenne pepper, 1 teaspoon apple cider vinegar, 2 tablespoons of water and 1 tablespoon of honey makes a quick syrup for a sore throat or persistent cough. When something cold touches the roof of your mouth, it can cause a cold headache, a dilation of blood vessels in the head, often caused by a nerve center located above the roof of your mouth. Pushing your tongue to the roof of your mouth as soon as you feel a brain freeze coming will help reduce pain faster as the heat from your tongue will help calm the nerves. Heat from blow dryers, curling irons and flat irons can cause temporary changes to the hydrogen bonds that hold hair together and can lead to permanent damage if done too often. The monounsaturated fatty acids in olive oil help protect hair and make it softer and more manageable. Leaving it on for 10 minutes and rinsing will add shine.